From their capital, Cuzco, in the central Peruvian Andes, the Inka created a huge empire reaching over 2,400 miles along the length of the Andes. The supreme head of state was the king, considered a living god ruling by divine right and the royal family controlled important areas of government such as the army. The empire’s economy was based on taxed labour. People contributed part of their labour to the state and the state-controlled religion. People farmed and herded animals, worked in mines and produced specialized goods such as clothing and pottery. The surplus was stored in numerous warehouses (tambos) for use by the army and state laborers. Inka colonists were settled in newly conquered territories as a way of managing subject peoples and spreading Inka language and customs. Local lords were enlisted into the system of government to maintain order in their provinces, rebellious communities were resettled in the Inka heartland. Inka engineers and laborers built a network of thousands of miles of roads and bridges to connect the empire. They constructed administrative centers, storehouses and military bases. A system of runners carrying information recorded on knotted strings called quipus also linked the capital to the regions. The capital of Cuzco was the center of the Inka world. Radiating from the central plaza the four main Inka roads led to the four corners of the empire. A sacred city of temples, royal palaces and residences for housing carefully-preserved bodies of dead rulers, early histories say the Inka likened Cuzco to the body of a puma (wild mountain cat), a symbol of Inka royalty. The most sacred building in Cuzco was the Coricancha, a temple devoted to the sun, the main Inka deity. Its stone walls were covered in sheets of gold to reflect the sun’s light. From this temple a system of sight-lines (ceques) radiated outwards dividing the surrounding landscape like slices of a pie. Over 300 shrines were situated at sacred places along these lines and there formed part of a sophisticated agricultural calendar. 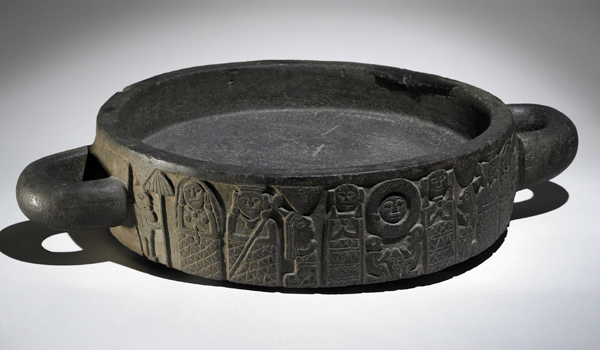 This massive circular ritual vessel or cocha is sculpted from a single block of black volcanic basalt from the imperial capital Cusco. This is one of a small number of surviving vessels of this size that were probably housed in the Coricancha—the Temple of the Sun—or adjacent sacred buildings. It was probably used as a receptacle for liquid offerings, perhaps simple to hold water and create a still, reflective surface regarded as an eye seeing into the underworld. The tightly nestled concentric coils of the snake’s body mimics moving water. Ten serpent heads are symmetrically arranged around the vessel rim in a pattern resembling the ceque system which was used by the Inkas to organize space in Cusco and the land beyond. Inka ritual vessels of a similar size are usually carved with spiraling serpents and the example above is no different. But this piece is unique as it is the only known example which is inscribed with figurative scenes. It is thought that these were applied in the early colonial period. On one side a large central solar disc with a face is flanked by two standing figures with their hands to their chest. Directly beneath the solar disc are two figures kneeling opposite each other with their hands clasped in front of them. Between them is a small diamond-shaped object with a face. The small cult figure appears to be the earthly manifestation or representative of the solar deity. On the other side, a complementary scene has a male and female figure at the center—possibly the Inka and his queen—who are the focus for a procession comprising a woman with a spindle, a hunchback and llamas being led in from either side. The scenes are likely to represent key times in the Inka agricultural calendar, perhaps planting or harvest festivals. The British Museum’s collection includes both Inka (1400-1531 C.E.) and Inka-colonial (sixteenth – eighteenth century) objects. 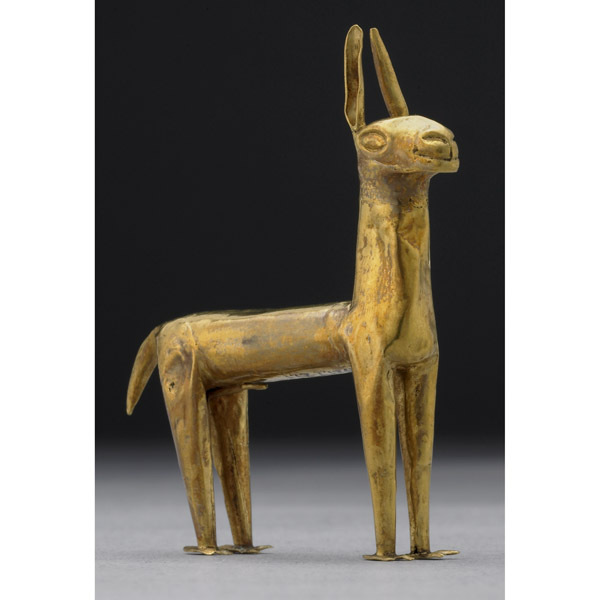 These range from large stone offering vessels (cocha) to miniature gold and silver figurines that were once used as offerings to the mountain deities in Inka state rituals. 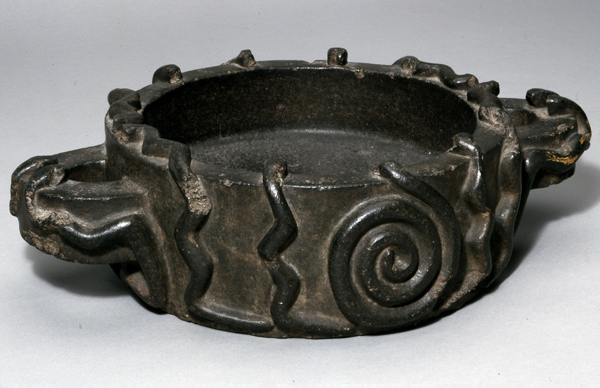 There are also examples of rare ceremonial pottery vessels fashioned in the form of an Andean foot-plough (chaquitaclla) and used for liquid offerings. After the Spanish conquest native artisans continued to create tapestries and wooden drinking vessels with new kinds of materials and motifs. T.N. D’Altroy, The Inkas (Wiley-Blackwell, 2003). T.N. D’Altroy, “Transitions in Power: Centralisation of Wanka Political Organisation Under Inka Rule,” Ethnohistory, 34 (1987), 78–102. T.N. D’Altroy and C.A. Hastorf, “The Distribution and Contents of Inka State Storehouses in the Xauxa Region of Peru,” American Antiquity, 49 (1984), pp. 334–349. T. Earle, “Wealth Finance in the Inka Empire: Evidence from the Calchaqui Valley, Argentina,” American Antiquity, 59 (1994), pp. 443–460. D. Guillet, “Terracing and Irrigation in the Peruvian Highlands,” Current Archaeology, 28 (1987), pp. 409–430. H. Lechtman, “Andean Value Systems and the Development of Prehistoric Metallurgy,” Technology and Culture 25 (1984), pp. 1–36. S.K. Lothrop, “Gold and Silver from Southern Peru and Bolivia,” Journal of the Royal Anthropological Institute of Great Britain and Ireland, 67 (1937), pp. 305–325. C. McEwan, Precolumbian Gold: Technology, Style and Iconography (2000). C. McEwan, Ancient American Art in Detail (London, The British Museum Press, 2009). C. McEwan, S. La Neice and N. Meeks, “The Gilded Image: Precolombian Gold from South and Central America,” Minerva, 7.3 (1996), pp. 10–16. M.E. Moseley, The Inkas and their Ancestors (London, 1992). J. Reinhard, “Sacred Mountains: an Ethno-archaeological Study of High Andean Ruins,” Mountain Research and Development, 5 (1985), pp. 299–317. P.W. Stahl, “Pre-Columbian Andean Animal Domesticates at the Edge of Empire,” World Archaeology, 34 (2003), pp. 470–483. Cite this page as: The British Museum, "Inka stone vessels," in Smarthistory, March 1, 2017, accessed April 24, 2019, https://smarthistory.org/inka-an-introduction/.